This is honestly one of the best discoveries ever. Not only is Nice cream the tastiest ice cream I have ever tasted, it's healthy, easy to make and requires no ice cream maker. Win win. Nice cream is simply frozen bananas blended up. Add some nut butter and dates and you have an amazing caramel flavoured ice cream. Add some cacao powder and you have a chocolate ice cream. Mix up with some berries and you have a berry delight. The choices are endless! This vegan treat is better than ice cream and has no added sugar. 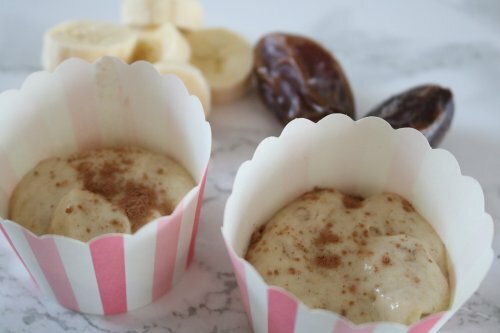 To make sure you always have a supply on hand - simply chop up some nice and ripe bananas, put them in some Tupperware and pop in the freezer. Then when you fancy an ice cream fix, take some out and whizz up with your favourite combinations. Peel the bananas, slice them, and pop them in the freezer. Take the frozen bananas out and leave for a minute or two. Then place the frozen bananas and nut butter and dates ( if using) in a food processor or blender. Blend well, until you get a creamy consistency. Enjoy immediately or freeze in a glass container until solid.